Finally a belt that gets it right. The combination of looks, reliability and strength are factors you rarely find in one belt. This Klik Belt Review will show you a stylish leather belt and a standard nylon. Both and all belts from Klik Belt use the world-famous Cobra Buckle. Strength is what we all we want in most items we look to buy and a belt is no exception. 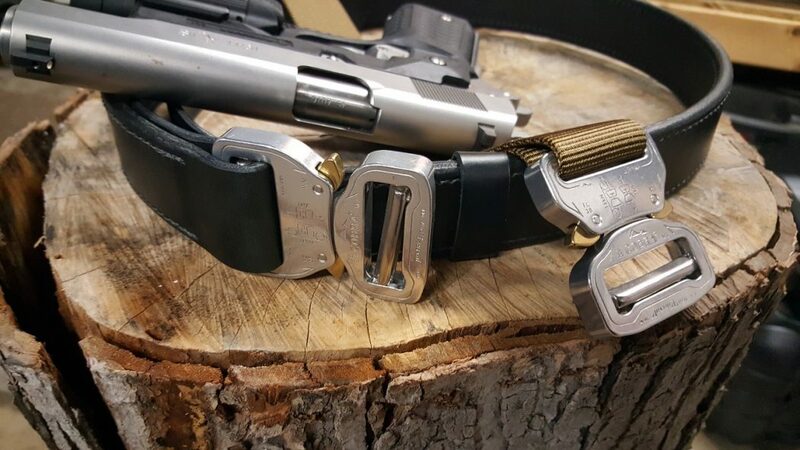 For belts whether it be one you wear daily for work or a belt you pull out for time in the field, these belts from Klick belt have the strength factor on point with real leather or the heavy-duty nylon that’s coupled with the indestructible Cobra Buckle. You won’t find another one that will last longer. 10 oz. Leather provides plenty of support for holsters and concealed carry. The Black Leather Gun Belt has been my daily belt a couple of months for when I have to dress up a little nicer for work. It offers a touch of class with a touch of badassery. Personally I like the look of the solid leather belt with no holes and the heavy-duty buckle. But it’s not for everyone. For the ones that don’t care for this looks, well, they just don’t get it. But I know you do. The leather belt has held up great. But, the leather does offer a little extra struggle to get it on. These belts don’t go on like normal belts. You normally have to feed the belt through your belt loops without that half of the buckle on it because it’s too big for most belt loops. The heavy leather is a little tougher to feed back into the buckle but after you’ve done it a few times, it’s not that big of a deal. The leather belts come with a thinner end just so you can loop it through the buckle end easier. Any time you spend putting the belt on, you will make up for 10 times over every time you have to undo it several times a day. I do experience one issue with the leather belt. It tends to loosen up a little over the day. It’s not a big deal as I can just give it a quick tug to tighten it up. The nylon 1-ply is my favorite of the two. Any struggles I have with the leather belt are not an issue with this one. The thin 1.5″ wide nylon webbing is very soft and flexible. It’s very easy to put on and feed through the buckle. It doesn’t offer the “class” the leather ones do, but if I’m not needing to look pretty, then I grab this one. Check out the short Instagram video below and see just how easy this belt is. If you haven’t gathered from what I’ve said so far on this Klik Belt Review, I really like these belts. They offer everything as described and I don’t expect them to last anything less than forever. For the few extra seconds it takes to put them on (mainly the leather ones), you will make up for every time you have to undo your belt to go the bathroom. The buckle is extremely easy to undo and snap back together. Go check the rest of all the Klik Belt inventory at www.klikbelts.com.